–from an ancient version of How to Win Friends and Influence People! This is what the Lord said to me: “Go and buy a clay jar. Then ask some of the leaders of the people and of the priests to follow you. 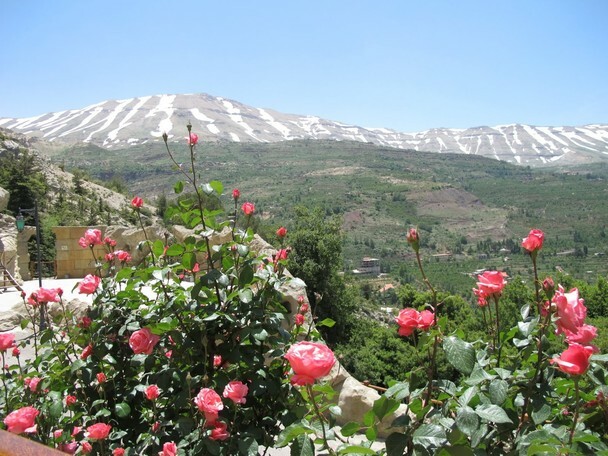 2 Go out through the Gate of Broken Pots to the garbage dump in the valley of Ben-Hinnom, and give them this message. 3 Say to them, ‘Listen to this message from the Lord, you kings of Judah and citizens of Jerusalem! 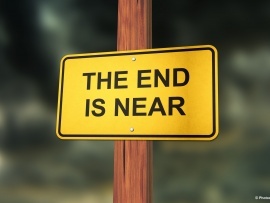 This is what the Lord of Heaven’s Armies, the God of Israel, says: I will bring a terrible disaster on this place, and the ears of those who hear about it will ring! It is not hard to imagine how annoying such a message would become. We know how much people appreciate being told they are wrong. In fact, when Jerusalem’s food supplies ran out during the Babylonian siege in 586 B.C., cannibalism resulted (see Lamentations 2:20 and 4:10). A visual, a prop, an action. All to make the message more clear, more pointed. 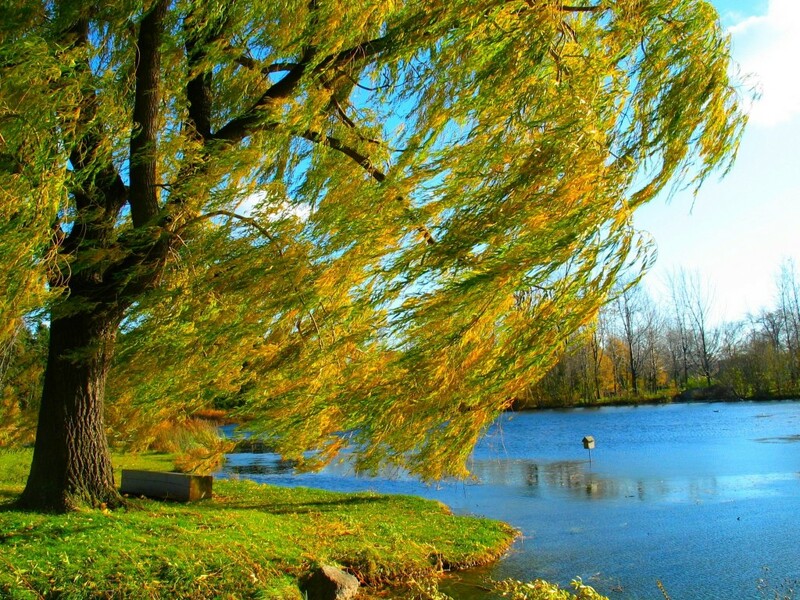 Time for us to stop and worship our God, the Creator and Redeemer and Sustainer of the world, our help in time of trouble, our everlasting hope and salvation. We sing our praises to no false god; we do not forsake the Lord of Heaven’s Armies. HERE is a young classic hymn, “In Christ Alone,” by Keith Getty (music) and Stuart Townend (Lyrics); sung by Kristyn Getty. The song was published in 2001. I love this hymn and am learning it by heart to keep my faith on the tip of my tongue! 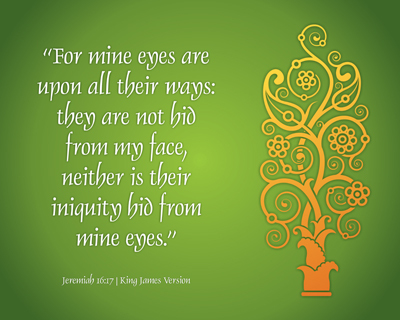 The Lord gave another message to Jeremiah. He said, 2 “Go down to the potter’s shop, and I will speak to you there.” 3 So I did as he told me and found the potter working at his wheel. 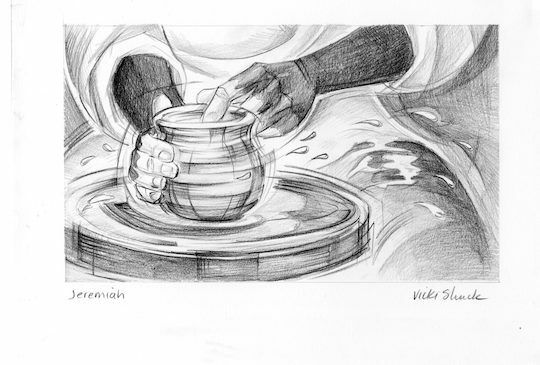 4 But the jar he was making did not turn out as he had hoped, so he crushed it into a lump of clay again and started over. 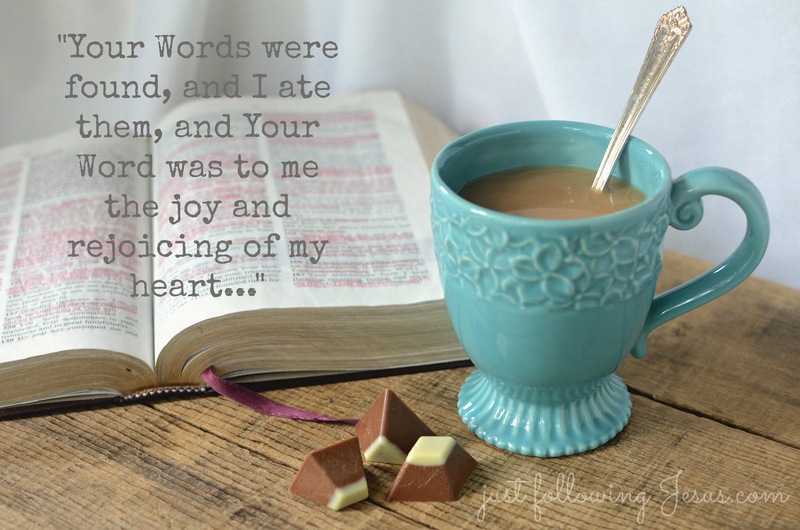 Jeremiah was sent down to the potter’s house, and there he saw three simple things, conveying to him a fantastic lesson. You may have observed the same things that Jeremiah did, for the art of making a pot has not changed through the centuries. The wheel is now turned by an electric motor, but that is about the only difference. Even this is still controlled by the foot of the potter. The clay is the same as it has always been. 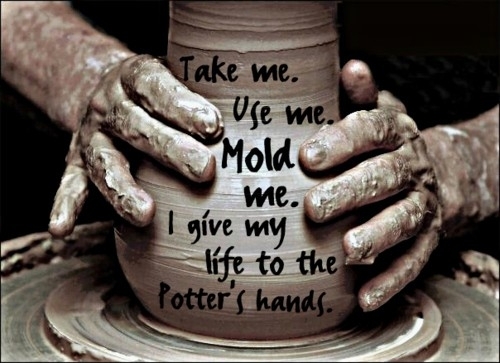 The potter is the same, with his capable hands, working to mold and shape the clay into the vessel he has in mind. 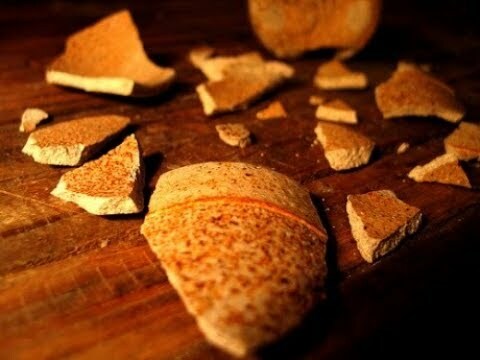 So Jeremiah, by watching, learned that an individual or a nation is clay in the Great Potter’s hands. He has a sovereign right to make it what he wants it to be. He has the skill and design to work with the clay and to bring it to pass. 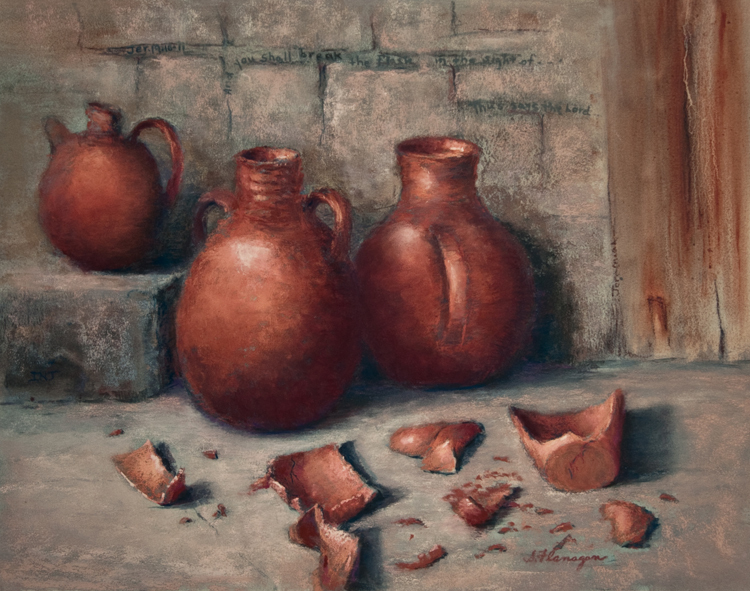 If there be some imperfection in the clay, something which mars the design, spoils the work, the potter simply crushes the clay down to a lump and begins again to make it yet a vessel according to his own mind. We can trust that the Lord is purposing everything for good. You could depend on snow and mountain streams in nature, but God couldn’t depend on His people! The people of Jerusalem are fed up with Jeremiah and his speeches about their sin and God’s coming judgment. 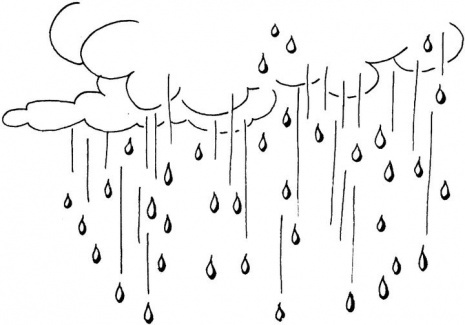 Jeremiah expresses regret that he ever asked God to spare them. Such a prayer is scarcely suitable for believers in this age of grace. Jerusalem will fall . . .
. . . and the people of Judah will be sent into exile. who puts his trust in me. 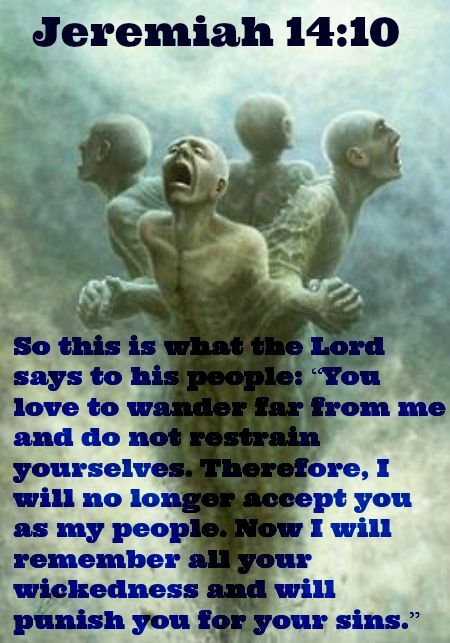 Unregenerate human nature is in a grave condition without divine grace, “desperately wicked.” Other translations have it as “exceedingly corrupt” (ASV), “desperately sick” (ESV), “too sick to be healed” (GNT). It may seem a harsh description but I have noticed, in my life and in others’, that we do not drift towards righteousness. Left to our own devices, we prove the truth of this verse. 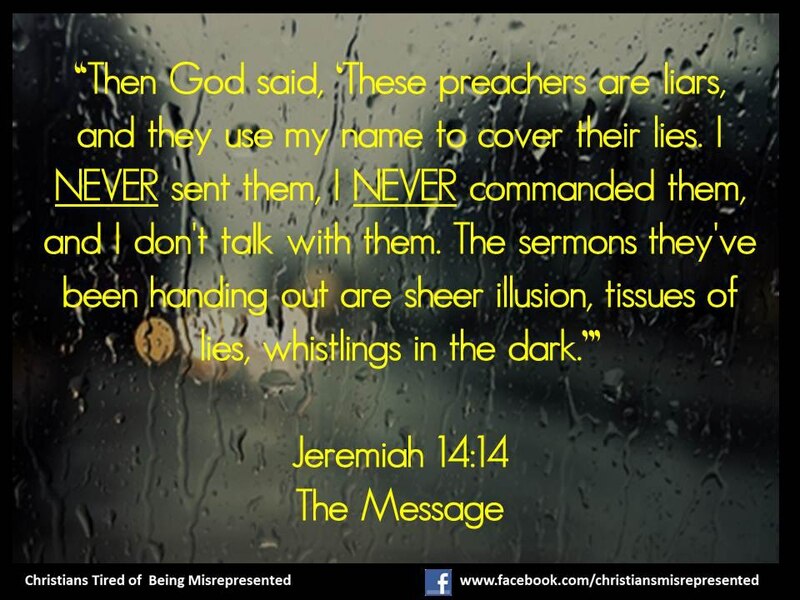 With this taunt Jeremiah is accused of being a false prophet. 19 This is what the Lord said to me: “Go and stand in the gates of Jerusalem, first in the gate where the king goes in and out, and then in each of the other gates. 20 Say to all the people, ‘Listen to this message from the Lord, you kings of Judah and all you people of Judah and everyone living in Jerusalem. 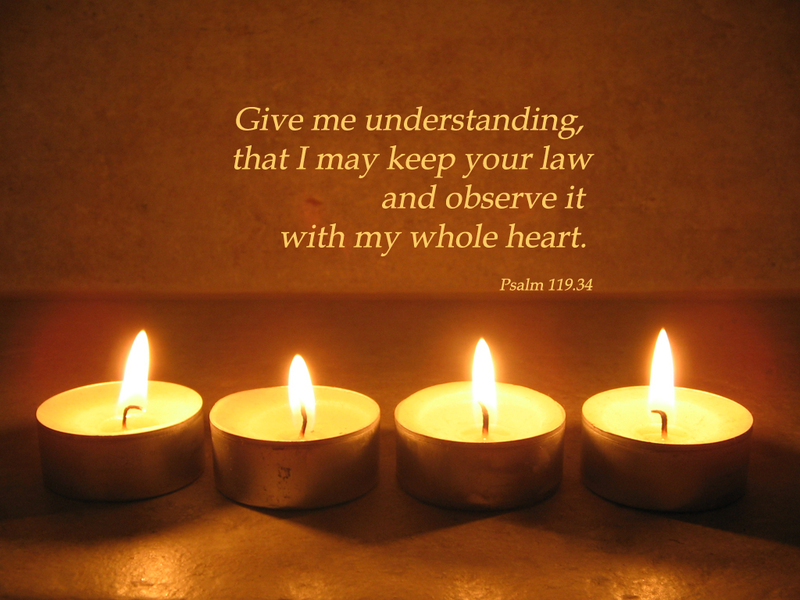 21 This is what the Lord says: Listen to my warning! Stop carrying on your trade at Jerusalem’s gates on the Sabbath day. 22 Do not do your work on the Sabbath, but make it a holy day. I gave this command to your ancestors, 23 but they did not listen or obey. They stubbornly refused to pay attention or accept my discipline. 24 “‘But if you obey me, says the Lord, and do not carry on your trade at the gates or work on the Sabbath day, and if you keep it holy, 25 then kings and their officials will go in and out of these gates forever. There will always be a descendant of David sitting on the throne here in Jerusalem. Kings and their officials will always ride in and out among the people of Judah in chariots and on horses, and this city will remain forever. 26 And from all around Jerusalem, from the towns of Judah and Benjamin, from the western foothills and the hill country and the Negev, the people will come with their burnt offerings and sacrifices. They will bring their grain offerings, frankincense, and thanksgiving offerings to the Lord’s Temple. A song of praise for our glorious Lord! “O Worship the King” was written by Sir Robert Grant. Born in 1779 in India, he went to college in England, became a lawyer, won a seat in Parliament, and returned to India as a director with the East India Company. In 1834 he was asked to be the governor of Bombay. 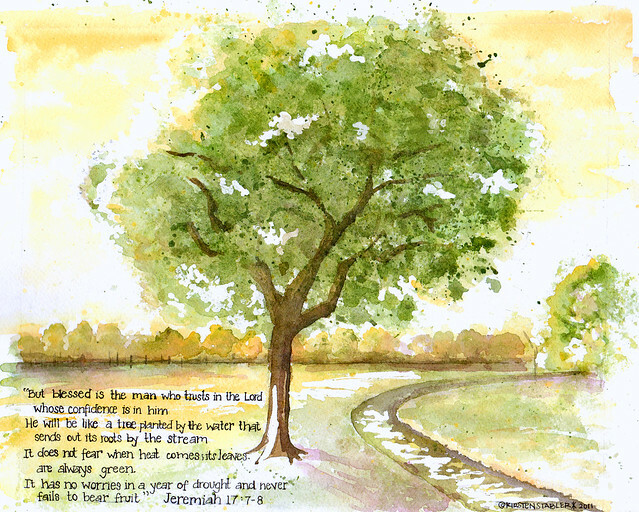 He died four years later, and is best remembered for penning this hymn, his rendition of Psalm 104. HERE it is performed in St. Anne’s Cathedral, Belfast. The Lord gave me another message. He said, 2 “Do not get married or have children in this place. Jeremiah is the only man in the Bible forbidden to marry. He will be childless, a sign that there is no immediate future for Judah. 5 This is what the Lord says: “Do not go to funerals to mourn and show sympathy for these people, for I have removed my protection and peace from them. 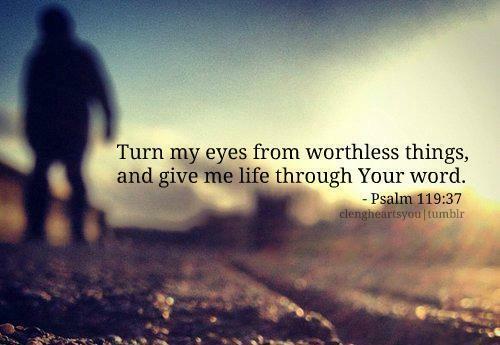 I have taken away my unfailing love and my mercy. 6 Both the great and the lowly will die in this land. No one will bury them or mourn for them. Their friends will not cut themselves in sorrow or shave their heads in sadness. 7 No one will offer a meal to comfort those who mourn for the dead—not even at the death of a mother or father. No one will send a cup of wine to console them. 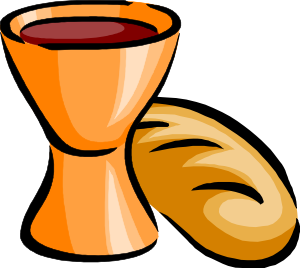 This practice of breaking bread in connection with death seems to be the origin of what the Lord Jesus consecrated into the grand memorial of His remembrance. “Neither shall men break bread for them in mourning, to comfort them for the dead; neither shall men give them the cup of consolation” (verse 7). There you have the Supper, in both its parts. It was a familiar custom among the Jews, but the Lord gave a unique significance to it, and stamped new truth upon it. It was connected with the Passover, for, as we know, that was the time of its institution. There was a particular reason for its establishment at that and at no other time, because it was to mark the impressive change from the great central and fundamental feast of Israel. A new and different feast was begun for the Christians. 8 “And do not go to their feasts and parties. Do not eat and drink with them at all. 9 For this is what the Lord of Heaven’s Armies, the God of Israel, says: In your own lifetime, before your very eyes, I will put an end to the happy singing and laughter in this land. The joyful voices of bridegrooms and brides will no longer be heard. God will send them into exile. 14 “But the time is coming,” says the Lord, “when people who are taking an oath will no longer say, ‘As surely as the Lord lives, who rescued the people of Israel from the land of Egypt.’ 15 Instead, they will say, ‘As surely as the Lord lives, who brought the people of Israel back to their own land from the land of the north and from all the countries to which he had exiled them.’ For I will bring them back to this land that I gave their ancestors. 20 Can people make their own gods? Each of us wrestles with the problem of inward purity. We might be able to put on a good show outwardly, but inwardly we are sinners by nature and we wage war against wrong thoughts, desires, and attitudes. 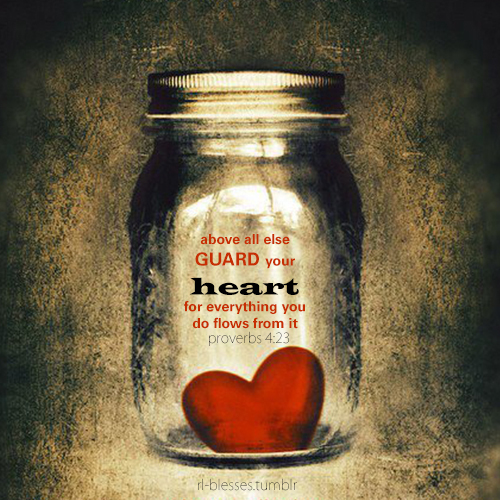 Psalm 119 shows us God’s Word is essential for becoming pure in heart. 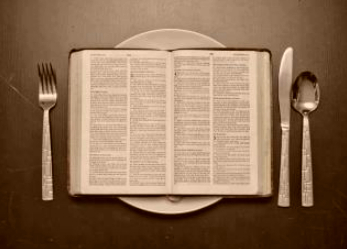 “The more we read the Bible, the stronger our faith becomes. The NIV has verse 34 as “Give me understanding, and I will keep your law / and obey it with all my heart.” Here is the Oslo Gospel Choir singing “I give you my heart.” Click HERE to listen. 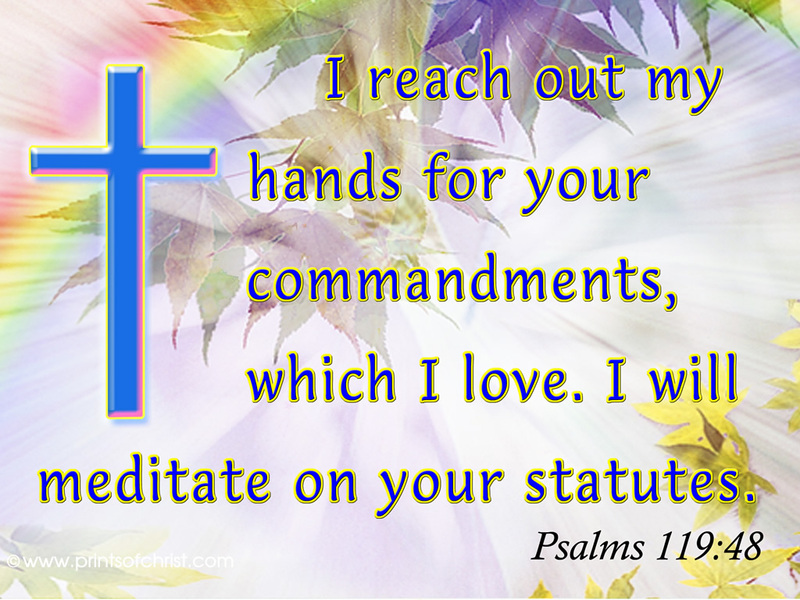 Lord, have Your way in me. 3 “I will send four kinds of destroyers against them,” says the Lord. “I will send the sword to kill, the dogs to drag away, the vultures to devour, and the wild animals to finish up what is left. 4 Because of the wicked things Manasseh son of Hezekiah, king of Judah, did in Jerusalem, I will make my people an object of horror to all the kingdoms of the earth. 5 “Who will feel sorry for you, Jerusalem? Who will weep for you? Who will even bother to ask how you are? “Therefore, I will raise my fist to destroy you. I am tired of always giving you another chance. and take away the children you hold dear. because they refuse to change their evil ways. than the grains of sand on the seashore. against the mothers of young men. to come upon them suddenly. her sun has gone down while it is still day. to be killed by the enemy. Jeremiah has heard the bad news and turns to the Lord for comfort. The following conversation between Jeremiah and God is precious to read. or a bar of bronze? Sometimes we find ourselves in circumstances that are beyond our control. This was the case for Mary and Martha as they were grieving the death of their brother Lazarus. At these times a word from Jesus can bring much rejoicing (John 11:41-45). Other times when Jesus speaks, His words bring correction. “Get behind Me, Satan!” (Matthew 16:23) and “O you of little faith” (Matthew 14:31) do not seem to bring joy. 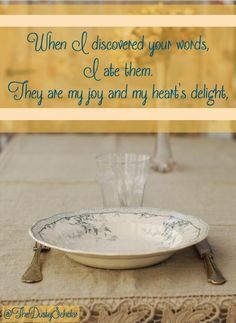 Yet Jeremiah said that God’s word brought him joy. We will learn in the next chapter that Jeremiah never married. Such a clear picture Jeremiah paints with his words! 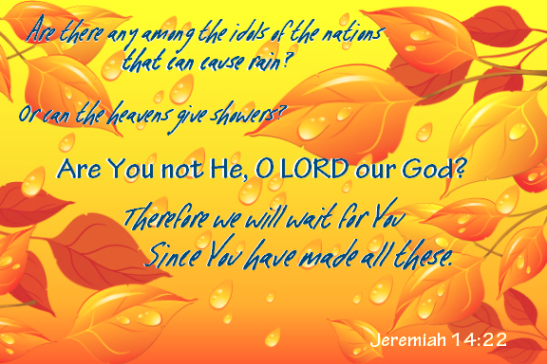 The prophet Jeremiah, confessing for the people, asks for relief from the drought and the famine. But the Lord says there will be no relief; rather, the people will be destroyed by sword, by famine, and by pestilence. 11 Then the Lord said to me, “Do not pray for these people anymore. We are instructed often in Scripture to pray unceasingly, with fervency and belief. So it is a bit of a shock to hear God say, “Don’t pray for them.” God’s patience had run out with the people’s continual sinning and he had made up his mind as to his course of action. Sad words: Too Late. 14 Then the Lord said, “These prophets are telling lies in my name. I did not send them or tell them to speak. I did not give them any messages. They prophesy of visions and revelations they have never seen or heard. They speak foolishness made up in their own lying hearts. 15 Therefore, this is what the Lord says: I will punish these lying prophets, for they have spoken in my name even though I never sent them. They say that no war or famine will come, but they themselves will die by war and famine! This is one of the most frightening themes in the Bible, in my opinion — that there are those who think they are serving God in their religious work, but God does not know them. Lord, help me be a true disciple! “Night and day my eyes overflow with tears. verse 22: So we will wait for you to help us. HERE is “While I’m Waiting” by John Waller. Perhaps you are waiting for something or someone . . . such a long time, it seems . . . and you may be weary. Jesus understands, and is beside you even in the waiting. You are currently browsing the DWELLING in the Word blog archives for October, 2017.